New York, USA -- Some time ago, when yoga was esoteric and meditation was something that only bearded mountaintop hermits in New Yorker cartoons did, there wasn’t much of a choice in meditation cushions. A few of the bigger (a very relative term) Zen and Tibetan Buddhist meditation centers made their own zafus, the small, round, firm cushions that Zen monks in Japan have been using for centuries. You went to the center--in San Francisco, Boulder or Vermont--to learn to meditate and you paid $25 for one of their cushions. Nowadays yoga is ubiquitous and meditation has been hailed by no less than Time and Newsweek as the path to happiness. However immaterial meditation may be, Americans have nevertheless highlighted its material--and its for-profit--aspects. Thirty or 40 years ago, when meditation first landed in North America, the business of making cushions was tiny and hardly profitable. Long-term residents of meditation centers sewed the covers. In return, they received room, board and ample time to meditate. The frustrating job of stuffing them with kapok--a silky fiber from the seed pods of tropical kapok trees--was relegated to the paying visitors, who meditated most of the day but were required to work for a few hours. The profits? Enough to pay for more fabric and thread, with a bit extra thrown in. But these days, the business of selling meditation cushions and other meditation paraphernalia has become crowded--and competitive. A quick Google search for “zafu” pulls up more than 200,000 results. At least eight U.S. companies are specifically devoted to meditation-cushions and supplies, and many others sell as a sideline. The going rate for a standard zafu and zabuton is about $50 each. Those who want something special, a zafu with a Japanese floral design, for instance, or a polished mahogany meditation chair--can easily pay a minimum of $75 for the fabric or up to $400 for the chair. The first major design change of the meditation cushion came in 1981. Chogyam Trungpa Rinpoche, one of the first Tibetan meditation masters to settle in the West, was distressed by his students’ poor posture. The zafu may have been suitable for small-boned Japanese who were flexible enough to sit in half- or full-lotus. But it was too small and insubstantial for big Americans. So Trungpa Rinpoche designed a firm rectangular cushion about eight inches high, which helped students sit up straight, with their knees raised well above the floor. The gomden took off in a modest way. Samadhi Cushions, which is associated with Trungpa Rinpoche’s organization, Shambhala International, has sold tens of thousands of gomdens over the years. It has copyright on the design and must keep a sharp eye out for competitors, including non-profit meditation centers, who assume that it’s all right to borrow the invention. Last fall, for instance, an upstate Zen center featured its own gomdens in its catalogue, though they removed it after receiving a firm phone call from Samadhi. But other companies, including non-profit meditation centers and for-profit New Age ones, have been ringing their own variations on the theme. Many are offering zafus stuffed with buckwheat hulls, which conform more easily to the shape of a meditator’s bottom but make loud rustling sounds with his or her every move. There are crescent-shaped cushions, the “better to support your tush,” as one company says. Carolina Morning Designs, a venerable company not associated with a specific meditation center, makes inflatable plastic zafus, for outdoor meditating. 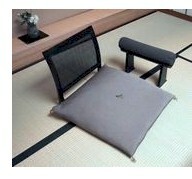 Other companies make tilted stands consisting of plastic ovals on tiny legs, and cushions with backs, presumably for dozing off during meditation. For those who want to something more luxurious, there are organic silk zafus in a rainbow of colors for $75 or $80. There are cushions in splashy Japanese floral prints. Or polished mahogany chairs with short legs and thick, flat cushioned seat, for $300 or $400. What makes it different from sitting on an ordinary chair? Well, nothing, really. Like meditation itself, it’s all in the mind.